This club guidance relates to paddling on the Tidal Thames, (i.e. downstream of Teddington lock). A more detailed club guidance to paddling on the Tidal Thames can be opened in a Word document. The Fairway is the deep channel approximately in the middle of the river. The Fairway can be offset to one side in some locations, (notably on Barns Reach where it is significantly nearer Barn Elms than Fulham). Keep the Fairway clear for faster or larger craft. 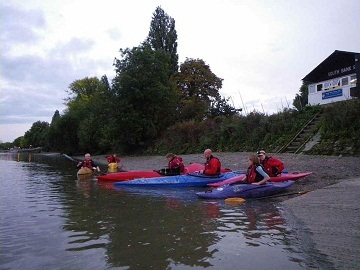 It is necessary to be aware of and to take special care when paddling with the tide through the Crossing points, which allow you to cross over to use the inside of the next bend. Keep Right at all times and allow room for faster craft to overtake to your left. Follow the right hand bank including all its bends/curves. Do not swing too wide to your left. 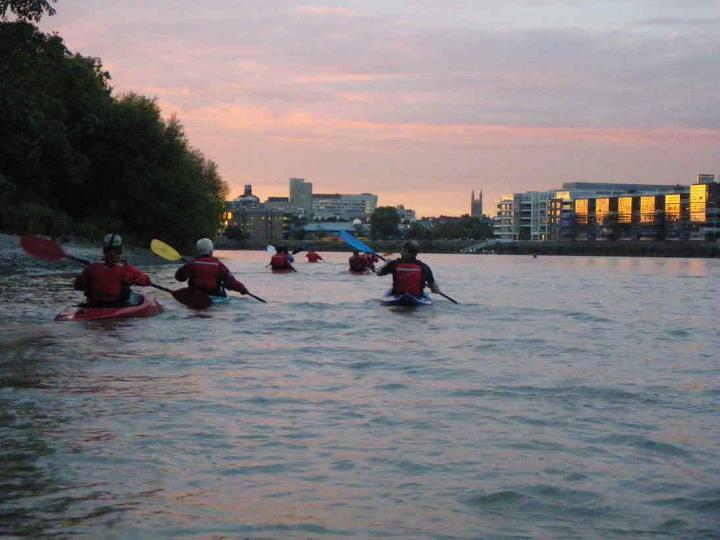 On the Ebb tide and paddling down river with the tide - aim to be just left of the red can buoys on Hammersmith and Kew bends to allow room to your right for craft coming up-tide working the inside of the bends and inside the line of the red can buoys. On the flood tide and paddling up river with the tide around Chiswick bend aim to be just left of the green can buoys to allow room inside for rowers/kayaks going against the tide. Special rules apply for rowing, kayaks and canoes which allow you to use the inside of the bend and utilise the slack water and eddies close to shore. Keep as close in to the shore as possible and allow overtaking craft room to pass on your outside, but still inside the line of the red or green can buoys. Around the Hammersmith and Kew bends red can buoys mark the outer limit of the special inshore zone. Keep as close inshore inside the buoys as possible. Around Chiswick bend green can buoys mark the outer limit of this special inshore zone. Keep as close inshore inside the buoys as possible.